To insure the safety, security, and defense of high-rise buildings from terrorist attacks, natural acts, or accidents, within the United States. 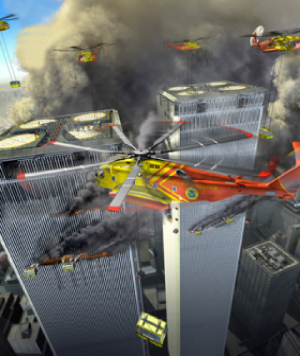 This Act may be cited as the ‘Skyscraper Defense Act’. Herein the Skyscraper Defense Act is referred to as ‘The Act’. 2. To affirm Congress’ authority and responsibility under the Constitution Article I, Sect. 8, Clause 1, “provide for the common Defense”; Clause 10, “to define and punish … Offences against the Law of Nations”; Clause 11, “To declare War”; Clause 12, “To raise and support Armies”; Clause 18, “to make all laws which shall be necessary and proper for carrying into execution the foregoing powers”. B. The Act cannot be repealed by implication. D. ‘Major Emergency’ is defined as an event that threatens lives within a building covered by The Act and/or the physical integrity of a building covered by The Act. 4. SDA to determine the cities or areas, outside of major cities, that warrant the creation of teams of Skyscraper Defenders. (d) Regular evacuation drills to be held in conjunction with local emergency responders.